Have you been able to keep up with EZ Tap? If so, where do you currently stand with it? Last spring we worked on developing a business plan for our venture. We completed a preliminary plan but decided to hold off on an in depth plan until after the summer. Over the summer Chris and Evan spent 10 weeks at Bucknell learning coding languages and beginning to write code that would be used for EZ Tap. 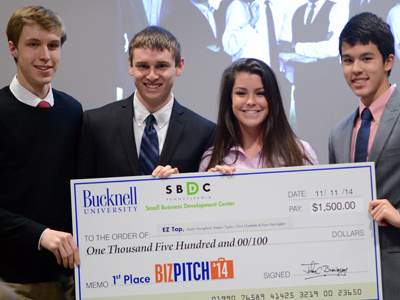 What were some of the biggest takeaways you learned from participating in the BizPitch and further in the Student Startup Madness Competition? It is important to be able to adapt to new ideas. This includes recognizing that your originally planned path for your business venture may be different from the most successful path. What do you consider the most useful piece of advice you have received in starting and/or pitching EZ Tap? When pitching our idea, one of the most useful pieces of advice we got was to look at our product through the eyes of the customer. This led to us doing a survey of potential customers, which I believe increased the credibility of our pitch. What is the best advice you could give to new contestants as they prepare for the competition? The best advice would be to prepare for the questions. They are the most difficult part and if you fail to answer a question, well that is the most likely cause for the team not to win. How have you dealt with adversity/challenges in developing your business venture? Most of our challenges came from not knowing what the next step was. We were either able to talk through it as a group and come to a logical conclusion or we appealed to the SBDC. The SBDC gave us a lot of good advice on how to proceed. Other challenges included compromising. With four team members, it was inevitable that there would be disagreements. We were either able to compromise or do a majority ruling in each situation. What is your long-term plan with EZ Tap? Our long term plans for EZ Tap are centered on a working prototype. As we are currently still developing the prototype, our long term plans are limited to determining potential clients based on the abilities and limitations of our prototype.